“Woody Guthrie is the original folk hero,” according to his entry in the Rock and Roll Hall of Fame, one of a number of post-humous accolades. While Woody’s contribution to folk music is widely recognised, his contribution to the struggle against fascism and racism, which he saw as part of the wider struggle for the rights of working people, is less well known. The anti-fascist songs that Woody recorded during the war were not released at the time, some only being released recently, over 50 years later. 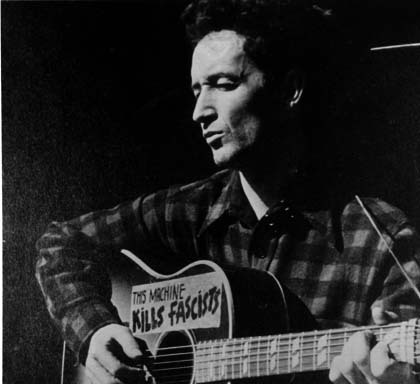 It is commonly acknowledged that Woody influenced many singers, most famously the young Bob Dylan, who emulated him and paid tribute to him in his Song to Woody Guthrie. His music has impacted on a new generation recently with the release of an album by Billy Bragg and Wilco, Mermaid Avenue, breathing new life into previously unheard lyrics. Woodrow Wilson Guthrie was born in Okemah, Oklahoma, on 14 July 1912 into a family that was doing relatively well for itself. His father, Charles, was a cowboy, land speculator and local politician whose luck was to turn bad causing him to suffer financial ruin. Woody’s life was marked by tragedy. The death of his older sister, Clara, in a fire and the institutionalisation of his mother, Nora, devastated his family and home. The hostility towards the migrant workers by locals and the naked exploitation that Woody witnessed were to have a deep impact on him. On a personal level he enjoyed success in his music career, singing about social justice on Californian and Mexican radio stations with his singing partner, Maxine Crissman. Guthrie’s songs became famous in California but he was restless and in 1939 moved to New York City. He hooked up with his friend Will Geer (who later played Grandpa Walton in the television series, The Waltons) and was embraced by the left and its vibrant music scene. Woody became friends with Huddie Ledbetter (Leadbelly), Cisco Houston, Burl Ives, Pete Seeger, Sonny Terry, Brownie McGhee, Josh White, Millard Lampell, Bess Hawes and Sis Cunningham among others. Together they sang in favour of the progressive political causes of the day. Woody and Will Geer sang at rallies and meetings in support of the Communist Party and Woody wrote a column for its newspaper, The Daily Worker. When pressed on the question of whether he was a member he answered, “I ain’t a communist necessarily, but I been in the red all my life”. It was during this period that Woody penned a true classic that has reached well beyond America’s shores, the song Union Maid. In 1941 Woody travelled to Portland, Oregon, to whip up support for a hugely ambitious rural electrification project. The Bonneville Power Administration was raising funds through public subscription to harness water power and employed Woody to record songs for a month. Woody waxed lyrical about the amazing sight of the Grand Coulee Dam and what electricity would bring to the rural Northwest. His recordings were played at meetings and rallies where people bought bonds to bring power lines over the countryside to their homes. The day after the song was broadcast on the This is War radio show in 1942 a New York newspaper ran a story headlined “Commie Singers Try to Infiltrate Radio”. Pete Seeger has said it was the last radio show that the band were offered as many of them went to war. In later years Seeger and other band members went on to form the Weavers, the most famous and influential US folk musicians of their day. “In the mountains and canyons quiet as a deer. Down in the forests knowing no fear. You lift up your sight and down comes a hun. After working on a CBS radio show called Back where I Come From, which increased his fame, Woody wrote his semi-autobiographical account of his Dust Bowl years, Bound for Glory. Written in 1943 the book tells of his and his fellow unemployed workers’ journeys across the US by boxcar, thumb and foot. The hypocrisy of “Jim Crow” racial segregation, in the wake of a war that was supposed to be fought against similar ideas, was highlighted by the brutal treatment of Isaac Woodward. Woody’s marriage to Mary broke down during the war and he developed a relationship with a young dancer called Marjorie Mazia. They were married in 1946 and together they had four children: Cathy, who died aged four in a tragic accident, and Arlo, Joady and Nora. Woody composed children’s songs during this time, which were acclaimed and are still listened to and sung by young people today. Woody’s as yet undiagnosed illness brought tensions in his personal and professional life that spurred him to leave his family and head for California with his friend “Ramblin” Jack Elliott. In California Woody met Anneke van Kirk, whom he married. They had a daughter, Lorina Lynn. Woody’s health continued to decline and he returned to New York where he was eventually diagnosed as suffering from Huntington’s Chorea, the same degenerative disease that had institutionalised and destroyed his mother some 30 years earlier. In 1954 Woody admitted himself to a New Jersey hospital, the first of several that he would be in and out of for the rest of his life. While at Creedmoor State Hospital in Queens, New York, Woody Guthrie died on 3 October 1967. Woody left a rich legacy, one that is woven into the fabric of the USA. Like Joe Hill before him he understood that, “a pamphlet is never read more than once but a song is learned by heart and repeated over and over”. The single song that stands as his testament is This Land is Your Land, which has become the unofficial anthem of the USA.